“Ay me, but what is this? I’ve run out of Amethyst. 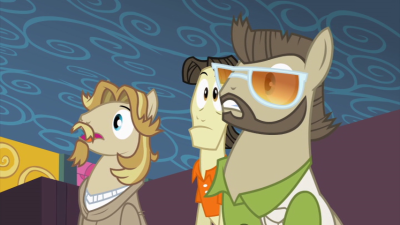 The Cutie Mark Crusaders want nothing more than to get their cutie marks. Apple Bloom, frustrated with waiting, takes a shortcut. It backfires. Two major facets to this episode: The first is cutie mark lore, the second is Apple Bloom’s impatience and how it affects the ponies around her. Apple Bloom really wants her cutie mark. Really really really really. She gets so bummed out that she doesn’t have one that, after Zecora uses a magic potion to fix her teeth, she steals some magic flowers to gain one. Much like Twilight Sparkle’s “Want It Need It” spell a few episodes ago, it goes very wrong, and the remainder of the episode is spent juggling cutie mark superpowers and repairing the damage. 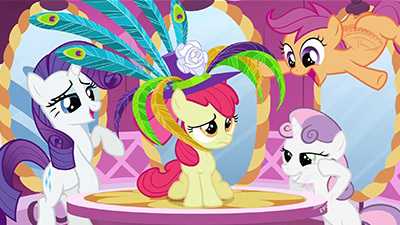 Most of the ponies in Ponyville flee the non-infectious Cutie Pox, and the cure can only be created by Apple Bloom admitting she stole Zecora’s flowers. 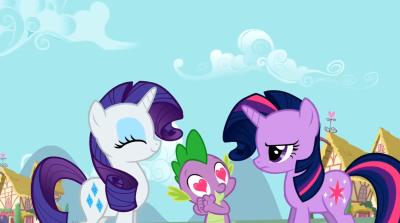 The cutie marks themselves are interesting. Every pony’s cutie mark reflects a special talent that they have. Magic, throwing parties, everything related to apples, and so on. The marks that Apple Bloom receives grant her those abilities, and force her to use them until she’s exhausted. This opens up a question about whether cutie marks cause talents or are caused by them, and I don’t think I have enough experience or authority on that issue to go into it. Literally a third of the episode is spent on showcasing her loop-de-hoop and spinning plates abilities. I think that’s why I don’t like this one; it feels like there’s an awful lot of filler. As an episode exploring cutie marks it kinda works, but there’s just so much hooping and spinning that I feel like not much gets done. I absolutely love how much time the Crusaders are getting this season. They’re adorable. They’re great characters, they have distinct goals and motivations. They’ve been in half of the episodes so far, and I hope that continues. I especially love how quickly Apple Bloom reverts to form at the end. She learns about patience and waiting, but she’s still an itty bitty silly filly. Okay, let’s get this part out of the way. Ahem. 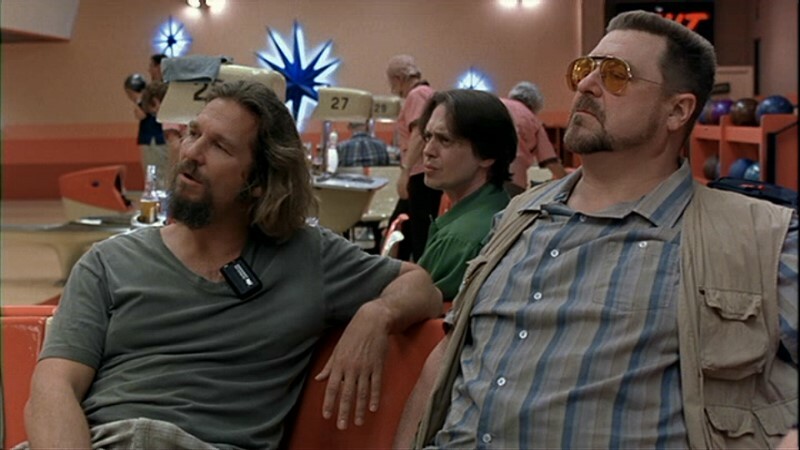 There is a Big Lebowski reference hidden in plain sight in the bowling alley oh my god that is so cool. Also bowling is a thing in ponydom somehow and that is also so cool. Interestingly enough, while you’d think this would be a sport that unicorns would have an inherent advantage in, there’s only a few unicorns in the bowling alley; there seems to be more earth ponies there than anything else (including the one who gets their cutie mark for it). I think Weston hits the nail on the head with this episode overall – there’s not much of anything going on in it. There’s a bunch of fun gags, but the story itself isn’t particularly treading new ground. This actually sort of gets into a problem that the CMC have in general and Apple Bloom has in particular : there’s only so much you can get out of the blank flank angst angle before their stories start to feel repetitive. 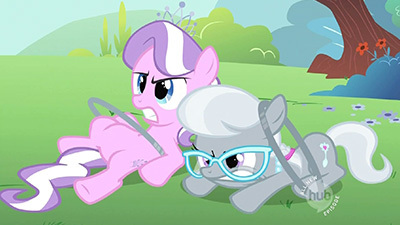 They’re at their best when their cutie mark hunting is in the background and not the main point of the plot (har har). Show Stoppers was a fantastic story about that hunt, but after that episode, that well’s a bit dry. The fact that this episode spends nearly half of the duration having Apple Bloom show off her loop-de-hooping (and plate-twirling) kind of highlights that there’s not a lot to actually get out of this story. It drags on for way too long, and while we get one really great visual gag out of it, there’s otherwise not all that much to justify how long we linger on the scene. Once her cutie pox hits full swing, things do become significantly more fun, if only due to the storm of gags that follows it. The fluer-de-lis mark and the compulsive French that comes with it might be my favorite bit of the episode, almost entirely due to Applejack’s reaction to it. Also, the red shoes being the cutie mark to really highlight the problem is a nice touch. I’m actually kind of struggling to come up with more to talk about for the episode, because even in the third act of it, there’s exceedingly little to go on. The lesson about honesty and patience doesn’t feel particularly forced, it’s just extremely simple. 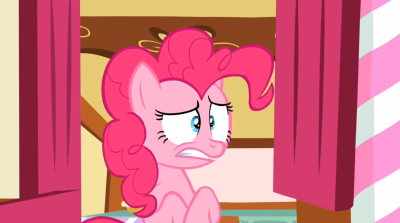 We do get Pinkie stealing the end scene when she mistakenly thinks that she’s the one who’s getting cornered for dishonesty (which is great), but the actual plot beats don’t take much to get through. And I think that’s really the problem with this episode. I can point to a bunch of “oh man this part was great!” moments in it, but they aren’t strung together all that cohesively, and the episode as a whole comes off feeling like a bunch of filler. It’s a story we’ve more or less already seen, that could have been done in about five minutes, stretched out to fill 22 minutes. I don’t actually dislike the episode, but neither can I really bring myself to call it good. It might actually be the weakest CMC episode of the entire series. Weston and Tessa pretty much summed up the non-episode-ness of this episode, so rather than beat a dead hor– erm, reiterate a similar sentiment, I’m going to do what I do best when in slot #3 and go tangential on your plots. First up: Applebloom’s cutie mark acquisition obsession. While I’m also in the “DEAR LUNA I GET IT ENOUGH WITH THE CUTIE MARKS ALREADY” camp, I can recall how I had a similar obsession with getting a Nintendo Entertainment System when I was in the first grade. I’d write about it in my school journal constantly, would beg to go over to “the boy with Nintendo’s house” (I could spell Nintendo but couldn’t spell his name) to play his games, would draw pictures of NES games all day, and would constantly ask my parents to rent an NES from the video store for the weekend. In one of my drawing notebooks I even wrote an amusingly contradictory message to myself in regards to my NES obsession: “I’m doin’ kinda fine without it! (NOT GOOD AT ALL WITHOUT IT! )” So with a somewhat bashful understanding, I can relate to what the CMCs (and Applebloom in particular) are feeling with respect to this obsession over getting their Cutie Marks. Spoiler alert: in time my parents did buy an NES, and it was absolutely everything I had hoped it would be and then some. As dumb as it sounds, the NES was really a key player in helping me discover what I truly enjoyed (music, artwork, games, programming, computers). I’m not sure what the future holds for the CMCs, but I’m looking forward with nervous excitement to an episode where they get their marks and find out whether the wait was truly worth it for them. Oh, and then there’s this. Any time we get to see these two d-bags get what’s coming to them is a good time in my books. This episode also does some oblique world-building in a few ways. 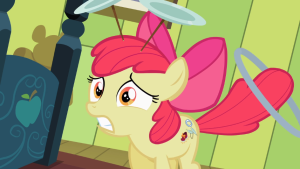 When Applebloom obtains a second cutie mark, everypony (including her) is shocked and unsure what to make of the situation. The youngsters assume it’s fake, but Cheerilee is wise enough to know that absence of evidence is not evidence of absence; in other words, just because nopony can recall ever hearing about multiple cutie marks doesn’t mean it’s not possible. Applebloom’s family’s reaction is similar: they can’t believe it at first, but when it’s staring them in the face they accept that it must be possible after all. I see this as evidence that, much as we still don’t fully understand everything that happens with our own bodies, Equestrians don’t fully understand all the mechanics (or magic?) behind cutie marks and are thus at least somewhat open-minded to different possibilities. This reminds me of a physics lab in which we had to measure the effect of gravity: we knew what the answers were going to be from the get-go, but were any of us to stumble on some setup that resulted in a different value for gravity, would we immediately assume we were wrong and change our experiment until we arrived at the measurements we were expecting, or would be open-minded enough to accept this unexpected result as a real possibility? The cutie pox itself is interesting as well, both in what it does (the power of the cutie mark compels you!) but also in the lack of knowledge the common pony has about it and the apparent nonchalance Zecora has toward it. Back during the Bridle Gossip deconstruction I posited that the Ponyville residents’ reactions to Zecora might be at least somewhat justified since it’s evident that many (most? all?) of them had never actually seen a zebra before or even knew what one was, and I’m going to extrapolate this further to suggest that the knowledge gap between pony and zebra might be even more substantial than we first thought. To the ponies, the pony pox is an uncurable illness, whereas Zecora’s pretty much like, “I have the cure right here young foal, I carry it around with me all the time lol.” Were the two species on better terms with each other and more willing to transfer knowledge, I suspect everypony would recognize the pony pox for what it was: an unfortunate illness with a fortunately straightforward cure, not some mysterious hex that sends everypony running down the street in a (hilarious, by the way) gaggle of hooves and wings. And in a quick detour to marketing weirdville, I guess MLP:FiM figures with cutie marks and other random images emblazoned all over them is a thing, as evidenced by the “Cutie Mark Magic” line of toys (modeled here by Rainbow Dash and Pinkie Pie… I feel kinda sorry for them for being tattooed like that). I suppose one could imagine that those toys were inspired by this episode, but I think it’s simply a case of marketing going in a completely different direction than the show. 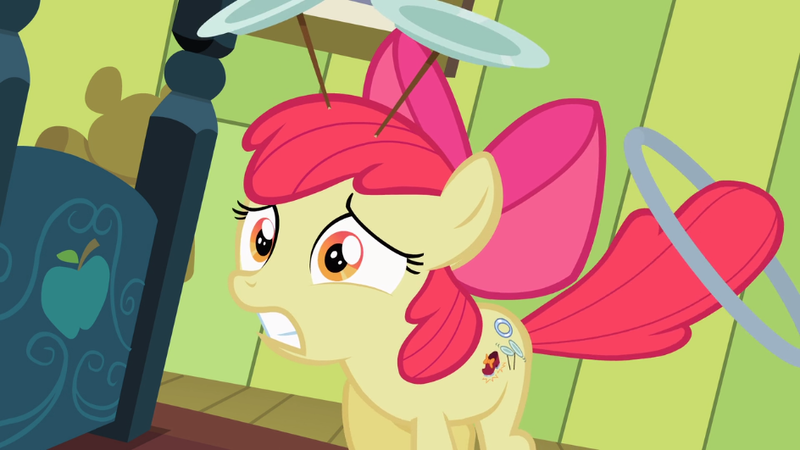 Oh, and lest I forget to mention, that Applebloom was able to keep those plates spinning on her head throughout everything that happened in this episode is amazing, cutie pox or not. I went through a juggling and plate-spinning phase a while back and boy it’s tough to keep them plates going! So anyway, okay episode for me, not in my favorites but not in my least favorites either. The song that sticks out for me this episode is Applebloom’s theme, which is more of a little jingle that plays when she’s first showing off her hoop skillz and at the very end when the CMCs go off to crusade some more. I thought I had an extended remix of that somewhere, but for the life of me I can’t seem to find it. Blargle! In the meantime, have The Crusaders Go Crusading (8-Bit) by RainbowCrash88, which totally isn’t that song but a fun take on the CMC theme nonetheless. If I ever find that song I was thinking of, I’ll be sure to include it in the comments. No, there’s nothing particularly deep or memorable or groundbreaking about the plot, but I still find it a very nice mix of visual gags, character development, a nice little theme, and the subtle world-building Gerf got into. I even like how far they let the hooping and spinning play out, because they took something that could easily be dismissed as silly and weak talents and show just how amazing and richly varied having such abilities can be. They’re playing it as if it were real, as if this is suddenly Applebloom’s life now, up to the point of her family making plans to get her a job on the rodeo circuit where she can make an actual living off of it. We know it’s a fake talent, but I appreciate the exploration, and I don’t feel the time we spend there crushes out any of the other plot threads, which still get their time to shine. Again, not one of the great episodes, but definitely a good one. Even like how Zecora is played, and how the cure is ultimately about being honest, not just with everyone else, but with oneself and not living a lie when that lie is literally taking over every aspect of your life.